Apostles are pictured in court robes rather than as fishermen and tax collectors. They hold the scroll of the Gospels. 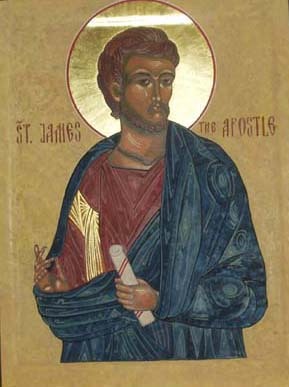 St. James the Apostle was sometimes called St. James the Great, and was a fisherman, the son of Zebedee. Female saints wear court dress, a long, brocaded tunic with gold and jewels, and may have their hair covered by a veil. 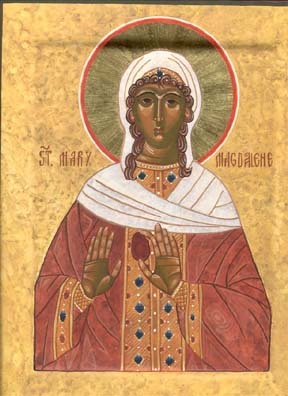 St. Mary Magdelene was a follower of Christ and sometimes considered "equal to the Apostles". In this icon she has her hair partially covered by a veil and holds a red egg, symbolic of the resurrection of Christ.